Mormon went on, “The things which are upon these plates pleasing me … I chose these things, to finish my record upon them” (Words of Mormon 1:4–5). 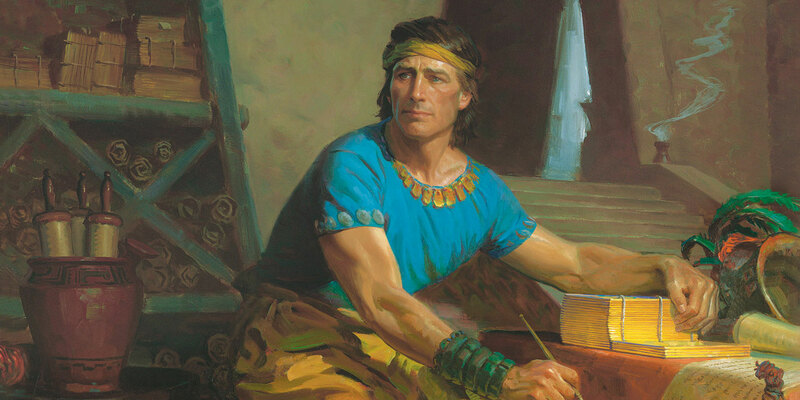 “I shall take these plates,” Mormon said, “and put them with the remainder of my record.” He did this, being prompted by the Spirit, “for a wise purpose” (Words of Mormon 1:6–7). Mormon expresses his hope that his people may “once again come to the knowledge of God” (Words of Mormon 1:8), and then relates what happened to these plates and how they ended up in his possession in the first place (Words of Mormon 1:10–11). Altogether, Words of Mormon 1:3–11 explains: (a) how and when Mormon found the small plates; (b) how they became part of the larger archive at his disposal; (c) his summary of their contents; (d) and his reasons for appending them to his larger record. In short, everything a reader would expect to learn in an introduction. Yet Mormon placed his explanatory material at the end, not the beginning. While proof maybe a strong word, it is certainly true that, as Hamblin pointed out, “This idea would have been counterintuitive in the early nineteenth century when title pages appeared at the beginning, not the end, of books.”6 This is evident in the fact that although he found it on the “last leaf,” the title page was published in the front, not the back, of the Book of Mormon. 1. The remainder of Words of Mormon (vv. 12–18) seems to have greater continuity with the first part of Mosiah, and some scholars have even suggested that it was originally part of a now missing portion of Mosiah. See Jack M. Lyon and Kent R. Minson, “When Pages Collide: Dissecting the Words of Mormon,” BYU Studies Quarterly 51, no. 4 (2012): 120–136. Others have suggested that Joseph Smith wrote vv. 12–18 as a summary/bridge back into the large plates. See Brant A. Gardner, “When Hypotheses Collide: Responding to Lyon and Minson’s ‘When Pages Collide’,” Interpreter: A Journal of Mormon Scripture 5 (2013): 105–119. 2. Joseph Smith, JS History, 1839, Church History Library, Salt Lake City, p. 9, in Karen Lynn Davidson, David J. Whittaker, Mark Ashurst-McGee, eds., Histories, Volume 1: Joseph Smith Histories, 1832–1844, The Joseph Smith Papers Project (Salt Lake City, UT: Church Historians Press, 2012), 352 (Draft 1), available online. 3. Walter Burkert, The Orientalizing Revolution: Near Eastern Influence on Greek Culture in the Archaic Age (Cambridge, MA: Harvard University Press, 1992), 32. 4. Burkert, The Orientalizing Revolution, 32. 5. William J. Hamblin, “Metal Plates and the Book of Mormon,” in Pressing Forward with the Book of Mormon: The FARMS Updates of the 1990s, ed. John W. Welch and Melvin J. Thorne (Provo, UT: FARMS, 1999), 22. 6. Hamblin, “Metal Plates and the Book of Mormon,” 21.